"Most people will probably be drawn to Hideko Udagawa's latest album by the thought of her playing Khachaturian's Concerto - Rhapsody and Sonata-Monologue. In some respects, however, it's Lyapunov's rarely heard Violin Concerto that proves the real treat. The piece is very retro. Dating from 1915, it sounds as if it were written 30 or so years earlier, though on its own terms it's wonderfully appealing. Lyapunov is a striking melodist. His use of Lisztian cyclic form seems remarkably fresh, and the concerto's rather grand manner suits Udagawa's noble style and steely tone wonderfully well. I prefer a warmer sound in Khachaturian, though there's no mistaking the commitment and dexterity she brings to both works. In the Concerto-Rhapsody and the Lyapunov, she is accompanied by the Royal Philharmonic, at its most opulent for Alan Buribayev. The unaccompanied Sonata- Monologue is riveting." Hideko Udagawa has performed extensively throughout the world and captivates international audiences with her artistry and enthusiasm. Critics have acclaimed her performances, commending her passionate commitment, dazzling agility and refinement of taste. As a protégée of Nathan Milstein, she has inherited the great Russian romantic tradition of violin playing. Her performances have spanned thirty countries across Europe, North America and Asia-Pacific, and more than one hundred cities and towns in the United Kingdom alone. Ms Udagawa made her orchestral debut in London with the London Symphony Orchestra under Sir Charles Mackerras, playing Bruch's G minor concerto at the Barbican Hall. 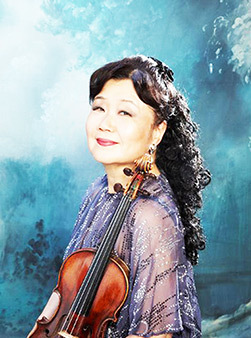 Highlights from her other engagements include performances with the Philharmonia under Leonard Slatkin, Royal Philharmonic under Paavo Jarvi, Royal Liverpool Philharmonic under Marek Janowski, City of Birmingham Symphony under Okko Kamu, London Mozart Players under Matthias Bamert, Russian National under Paavo Berglund, as well as Moscow Philharmonic, English Chamber, National Symphony, Bavarian Radio and Armenian Philharmonic Orchestras. In addition, she has made a twelve city tour in North America with the Mozarteum Orchestra of Salzburg and tours in Japan with Warsaw Philharmonic under Kazimierz Kord and with Japan Philharmonic. She has also toured as a guest soloist with many visiting orchestras to the United Kingdom, including Berlin Symphony, Polish Chamber and Bucharest Philharmonic. Invitations to many international festivals have included the George Enescu, City of London, Norfolk & Norwich, Perth, Brno, Ankara and Assisi festivals. In addition to live performances, Ms Udagawa has made a number of recordings which draw on her wide-ranging repertoire of over 40 concerti. She is particularly enthusiastic about discovering great unrecorded works. Her CD of works by Rachmaninov with the pianist Konstantin Lifschitz, for Signum Records, is the first ever collection of this popular composer's works for violin and piano and includes previously unrecorded pieces. Her CD with the Philharmonia Orchestra was released by Signum Records in 2010 to coincide with her recital in Cadogan Hall. This CD was chosen as 'Presenter's Choice' by Classic FM Magazine and includes works for violin and orchestra by Joachim and Ysaye, recorded for the first time. Autumn 2011 she recorded Khachaturian Concerto Rhapsody and Liapunov Concerto with the Royal Philharmonic Orchestra which was also released by Signum Records in autumn 2012. Recordings on Nimbus include Brahms and Bruch Violin Concerti with London Symphony under Sir Charles Mackerras, a CD devoted to the violin and piano music of Aram Khachaturian with Boris Berezovsky, in Spring 2015 rare 18th century concertos with the Scottish Chamber and in September 2015 Glazounov Concerto together with other works by Tchaikovsky, Chausson, Sarasate and Saint-Saens with the London Philharmonic. She has also made recordings of Heifetz transcriptions with Pavel Gililov for ASV and violin virtuoso pieces for Toshiba-EMI. As the great-granddaughter of one of Japan's historically most influential prime ministers, she enjoys the international performer's role as a cultural ambassador. Among several performances for the United Nations, she played at its 50th anniversary concerts in Vienna's Konzerthaus and the Victoria Hall in Geneva. She has also presented a recital in Tokyo in the presence of their Imperial Highnesses, the Crown Prince and Princess of Japan. Hideko Udagawa studied with Nathan Milstein, who was her only teacher in the West, in London and at the Juilliard School in New York. After living in Tokyo and New York, she is now making her home in London.